Beam clamp rigging rollers are used for installation and support of pipe in racks and modules where space is limited and cranes cannot access. Rollers facilitate improved safety, increase speed of installation, and protect expensive metal piping from damage. 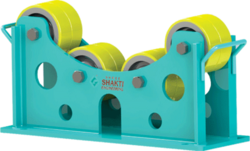 All Shree Shakti pipe rigging rollers are designed to be lightweight, so that pipe can be easily, safely, and efficiently be installed. Made from quality Polyurethane material. Multi Directional Rollers are designed for supporting pipe where expansion may occur due to thermal movement. 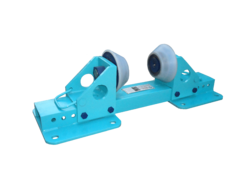 Rollers are made from hardened steel frame and high quality polyurethane material. Advantages: Unique design absorbs thermal expansion and contraction of pipes thus preventing from damage occurred. High load capacity nylon material. Made from hardened steel frame. Rollers available from 2” to 48”. SHREE SHAKTI ENGINEREING is famous for manufacturing a wide range of Beam Clamp Rigging Roller. Our Beam Clamp Rigging Roller comes with heavy duty roller and steel or urethane option and handle on sides for safe and easy installation. Beam Clamp Rigging Roller designed lightweight with beam clamps for quick installation and various roller head options so that pipe can be easily, safely and efficiently be installed. Beam Clamp Rigging Rollers are used to push or pull pipe vertically. These rollers can be hold from 2 – 48 inch pipe with capacities come different depend on roller models. Beam Clamp rigging roller fasten to both sides of the I- beam flanged offering a much safer option than more conventional clamping roller. Two bearing per each roller make sure smooth resistant free rolling. Beam clamp rollers feature a unique double sided clamping system that securely locks the roller on the I beam on flanged up to 12”. Three sizes available those are capable of carrying pipe from 2 – 48 inches. The modular design is ideal for rental fleets. Low profile designs enables rigging in tight space. 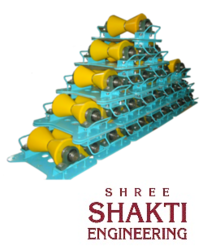 Shree Shakti Engineering is a leading manufacturer of wide range of Heavy Duty Pipe Roller. 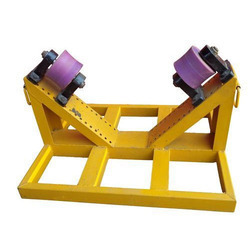 The Heavy Duty Pipe Rollers are used in hanging oil and gas pipeline projects. For extremely heavy pipe handling projects where a large span between pipes supports is required due to difficult to level terrain. SSE offers custom solution by offering heavy duty pipe roller suit a specific pipe diameter or varying diameter of pipe. 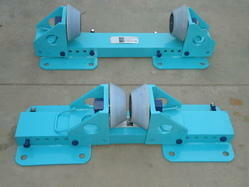 Heavy duty pipe rollers available sizes from 4” to 64”. Easy to use and storage. Both sides convenient handle for easy lifting. Long life and high durability. Adjustable pipe roller are used to support medium to large size pipes from the base on projects where they could be subject to movement. A multipurpose Adjustable Pipe Roller has been designed and manufactured for use in the installation of gas lines and pipe launching projects. Tighten the bolts to secure the frame to the base. The rollers are now secured in the correct position to safely launch the required pipe diameter. Pipe Pushing Rollers are made for massive loads to be carried while protecting the structural integrity of the pipeline during construction and deployment of the structure. our latest design incorporates a number of features, whilst providing a simple cost effective solution for handling pipe and providing a rolling solution. High load capacity polyurethane material. Minimize drag force during horizontal movement of pipe. Available for pipe size 6” to 48”. Applications: Shree Shakti Pipeline Rollers helps to protect exterior of pipe during crossing installations i.e. river, road, crossings etc. • Reduce pulling force substantially. • Handles for easy lifting and moving on site. • Easily adjustable to various pipe sizes. • Available for pipe size 2” to 70”. A Pipe Rotator has four rollers to cover any of your rotary application requirements.Conventional rotators are the best choice for slow or primarily static rotational applications such as welding, sand blasting, and the fabrication of a various size pipes. Available for pipe size 2” to 48”. Shree Shakti manufactures Industrial pipe rollers in order to protect, support and guide a pipe section during river and road crossings. Rollers are available in conveyor style rollers for various light wall to heavy wall steel pipe applications ranging from 2” to 48”. • Minimize drag force during horizontal movement of pipe. 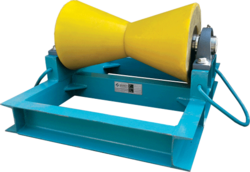 Pipe Rotators offered comes in different configuration choices and provides suitable process support involving providing pipe movements with wheels of rail travel. 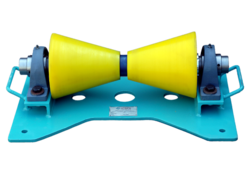 Further, these sturdy constructed pipe rotators allows safe and secure support to pipes and aids in its rotating so as to assist in multiple welding tasks. Some of its features include rotator used for lining up pipe and rolling for welding support; suitable for use on pipe sizes of 6″ to 48″. SHREE SHAKTI ENGINEERING is topmost manufacturer and supplier of huge variety of light weight portable pipeline roller. Pipe Roller Cone Type Nylon. Our Pipe Roller Cone Type Nylon can carry up to 24 inch oil and gas pipeline. Pipe Roller Nylon could easily withstand the forces exerted by the heavy pipeline section, the resulting metal on metal wear would have dramatically shortened the life of the rollers and potentially damaged the pipeline itself. Our Pipe Rollers Cone Type Nylon is manufactured to be simple to use and handle. Available size 2” to 24” and customize Pipe Roller Nylon also available on request. Pipe Roller Nylon can be configured to suit any pipe structure allowing for simple use and mobility during the construction phase of pipeline assembly. 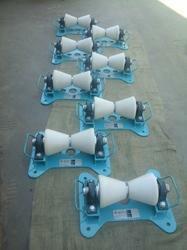 Pipe Roller Cone Type Nylon is used in pull or push pipe while crossing river or road. Pipe Roller Nylon comes with different load capacity on various size or model. Available size 2” to 24” and customize Roller available on request. Use high grade nylon material. SHREE SHAKTI ENGINEERING is engage in manufacturing a wide range of Pipe Roller Cone type PU Coated. Our polyurethane coated Pipe Rollers are the best solution for running the pipe through the structures, trenches & tunnels without damaging the coating of pipe. The benefit of polyurethane coated pipe roller compare to nylon or other material it helps pipe exterior coating while crossing and installation. Our engineers designed pipe roller for custom needs for pipeline installation and pipeline replacement. Rollers are designed to suit various pipe diameters and load capacities. Can take pipes with outer diameter of 2” – 48”. Easy to use, disassemble and transport. Cast Polyurethane Pipe Roller offered come in quality construction finish and provides for versatile application usage in different process applications. Coming with multiple advantages, these pipe rollers also come with greater strength and toughness properties that add to its durability and versatility. Some of its features include come with superior performance characteristics; offers better overall value in comparison to parts made with other materials; provide safeguard from issues related to equipment damage and reduced production revenue; offering consistent working performance; hardness of 30° Shore A to 70° Shore D; superior resistance to impact and shock, cut and tear, oil and solvents; provides for extended working life. 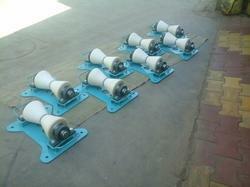 We are famous manufacturer and supplier of wide range pipe chair roller. Pipe Roller chair is used where axial movements are allowed and vertical adjustment are required. Rollers are made for higher load bearing capacity and smother operation. Pipe Roller Chairs are design to support pipe where movement may occur due to thermal expansion. Used when ceiling suspension is impractical. High performance and long life. Roller Diameter (in inch) 2" to 48"
SHREE SHAKTI ENGINEERING is leading manufacturer of wide range adjustable rigging roller. We are offering a progressive approach to solving the unique problems that inevitably arise in industry resulting in efficient design, fabrication and timely delivery of custom equipment. We are offering adjustable rigging roller sizes from 2” to 48” at domestic as well as globally. 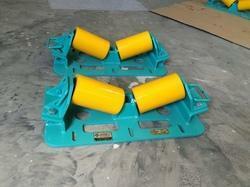 Adjustable rigging roller has many applications and specially used to installation pipe in to rack. Adjustable rigging roller comes in either Teflon coated or polyurethane coated. The advantage of polyurethane coated helps pipe exterior during installation and crossing river and platform. Available sizes from 2” to 48”, special and customize adjustable roller available on request. Convenient handles of both side for easy lifting. Shree Shakti Engineering is a leading manufacturer of wide range Beam Clamp Rigging Roller. Our Beam Clamp Rigging Rollers are used for installation of pipe in to rack. These rollers can be hold pipe from size 2 – 48 inches with its own maximum load capacity. The maximum load capacities are varies depend on model. Beam Clamp rigging roller fasten to both sides of the I- beam flanged offering a much safer option than more conventional clamping roller. Available sizes from 2” to 48”. Shree Shakti Engineering is topmost manufacturer and supplier of Multi Directional Pipe Roller. Our multidirectional Pipe Roller allows for liner movement and can be mounted onto any flat surface. Multidirectional Pipe Rollers are used to roll or move pipe in all directions. Clamp to any suitable support structure to make pipe fabrication and installation quick and easy. Our multidirectional pipe roller used for turning/pushing pipe in all directions, design allows for clamping to I-beams or other support structures. 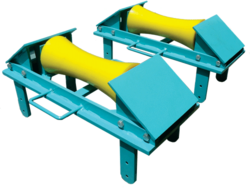 Pipe Rollers comes with handles on sides for safe and easy lifting and installation. Used premium quality raw material. Available sizes from 2" to 48". Shree Shakti Engineering engages in manufacturing and supplying wide range of Nylon Cone Type Pipe Roller. 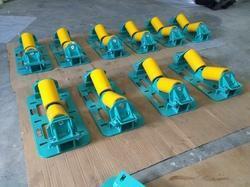 Nylon cone type pipe roller is used in Pull or Push while crossing river. Nylon cone type pipe roller available sizes from 2” to 24”, special and customize nylon pipe roller available on request. 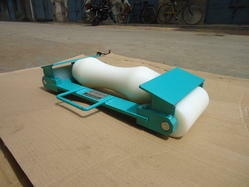 Nylon Pipe Roller comes with different load capacity on various size and model. Our Nylon pipe roller can carry up to 24” oil and gas pipeline. Pipe Roller Nylon can be configured to suit any pipe structure allowing for simple use and mobility during the construction phase of pipeline assembly. Available size in 2” to 24”.